Quoting IHCC, Curtis Stone is our current featured chef and we look forward to cooking along with him and his philosophy of using the best, freshest local and seasonal ingredients that you can find and turning them into simple and delicious dishes. To welcome Curtis, I chose his cottage pie recipe and made a few twists to suit what I have in my pantry. 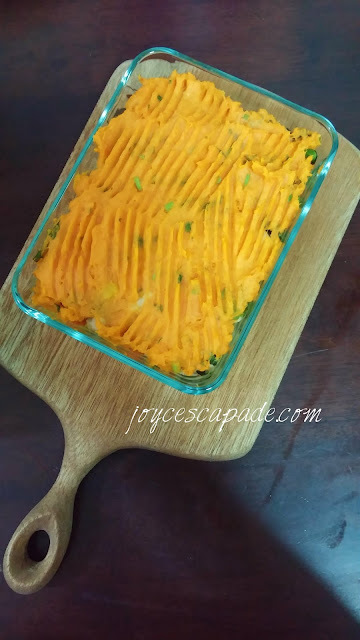 Recipe adapted from Curtis Stone's Cottage Pie with Sweet Potato. 1. Heat up oil over medium-high heat in a frying pan. Sprinkle the pork with salt and pepper. Add the pork to the frying pan and cook until they turn white. Transfer them to a bowl. 2. Heat up butter over medium heat in the same frying pan. Whisk in flour to form a thick paste. Add milk until you get a white roux. Add onions, mixed vegetables, and celery to the frying pan. Cook, stirring, until fragrant. Add water and simmer until the amount of water is reduced by half. 3. Return the pork into the frying pan. Reduce the heat to medium-low. Cover the pot and simmer for another 15 minutes. 4. Bring a large pot of water to a boil. Add the sweet potatoes and cook until fork-tender, about 15 minutes. Strain the sweet potatoes and set aside to cool. Then, mash the sweet potatoes with butter and chopped parsley. 5. Preheat the oven to 210°C. Transfer the pork and vegetables into a 7"x5" pie dish, top with the mashed sweet potatoes, and ruffle with a fork. Bake for 20 minutes or until the top is golden. I have eliminated white potatoes from my diet because they are one of the dirty dozens. Sweet potatoes are the best substitute so far. Mashed sweet potatoes with butter is really, really delicious! Looking forward to cook more dishes with Curtis Stone! I'm linking this post with I Heart Cooking Clubs (IHCC) for this week's theme, G'day Curtis! I have always liked sweet potatoes but never thought about mashing them, I will have to try that. Lovely dish. 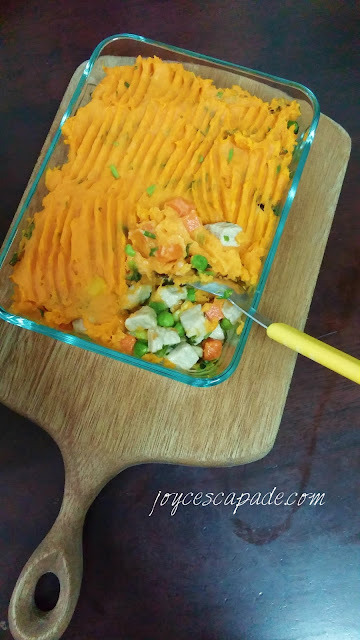 The sweet potatoes add such a pretty colour to this versatile and healthy dish. There is a lightness and airy look to your new page and the pot pie, like spring in the air with the color of blossoms and emerging growth. Happy spring! Thank you! :) I love the orangey hue too. Love the new website. It looks really nice. I also love sweet potatoes and think it is a great substitution. What a wonderful cozy supper dish! It's so colorful too! I absolutely love the new look of your site! So happy to be cooking Curtis Stone recipes with you:) I love that you replaced the white potatoes with sweet potatoes. Not only is it way more colorful, but it is way more nutritious. Great dish! I echo everyone else in loving the new look of your site too! Great recipe! I will change this with some other meat since I can't eat pork. This looks and sounds so yummy! I wanna eat it.. hehehe~! This looks delicious! Yummy, yummy, yum! Thanks for sharing this lovely recipe. I am going to find the time to bake it too! 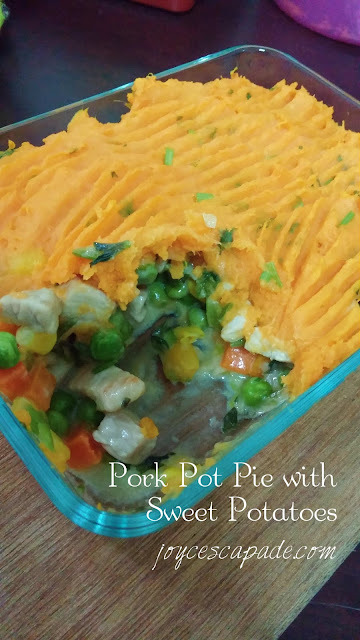 This Pork Pot Pie with Sweet Potatoes looks tasty and I'm sure it must be yummy! 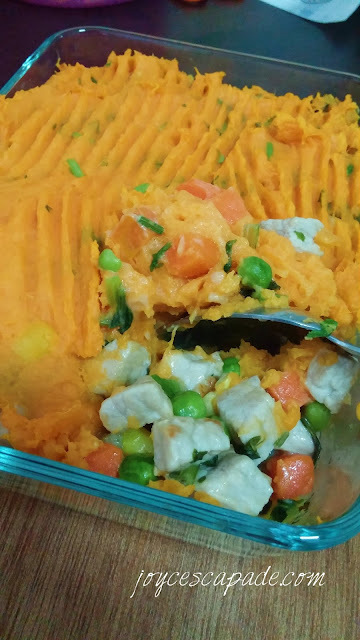 wow sweet potatoes so nice especially with the orange color.. usually purple right, great recipe but I will change it with chicken..
Another healthy and satisfying recipe to try this weekend.